The new five-story-plus penthouse condo on the town of Kingsville’s Lake Erie waterfront had its load bearing walls installed so quickly there were virtually no exposed ones left to showcase during a recent tour. 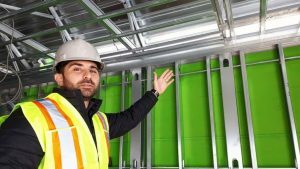 Windsor, Ont.’s A-LINX Building Technologies installed the factory-built walls, roughly 90 panels per floor, in just under three months. That’s about 35% faster than had a traditional construction method been used, such as steel post and beam or hollow core precast on masonry walls. A-LINX, which began operations a couple of years ago and is honing its business edge on the off-site assembly of light gauge cold-rolled steel framed load-bearing walls, now has five buildings in its portfolio, with projects like retirement homes and condos located from Windsor to Cambridge. These are architecturally engineered factory-made custom-built wall panels — including studs and tracks — connected using fasteners and welding, with predetermined openings for windows, doors and mechanical, exterior gypsum board, vapour barrier and available plant-applied EIFS. Co-ordinated in association with the flooring systems, they’re delivered to the construction site and immediately ready to be erected.